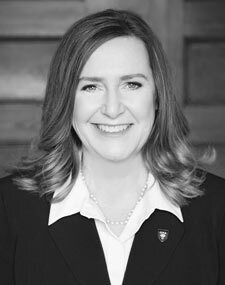 The Board of Trustees of The College of St. Scholastica appointed Dr. Colette Geary as the 12th President of the College on April 1, 2016. She began her term on July 1, 2016, and will depart by the end of 2019. Since her appointment, Dr. Geary has overseen a thoughtful comprehensive strategic planning process, informed by the College's mission and Catholic Benedictine values, that will shape institutional priorities for the next several years. She is engaged with community stakeholders and meets frequently with government, industry and business leaders to convey St. Scholastica's vision, to learn about challenges and opportunities, and to explore new collaborations. During Dr. Geary's tenure, the College has continued to thrive. Enrollment remains strong, particularly in graduate and online student populations, and thanks to careful financial stewardship the College has seen a positive bottom line throughout President Geary's tenure. Dr. Geary has led the College through significant capital improvement projects, including major renovations to the Somers residence hall and nursing laboratories in the Science Center. She has guided the College through the development of several new and innovative academic offerings that reflect a modern expression of its mission and values. Dr. Geary holds a Ph.D. in psychology from Stony Brook University in Stony Brook, NY, an M.A. in theology from the University of Notre Dame in South Bend, IN, and a B.S. in psychology from Manhattan College. She serves on the Board of Trustees of St. Catharine Academy in Bronx, NY, a secondary school that emphasizes academic excellence, global responsibility, service to others, and women's leadership. Dr. Geary came to St. Scholastica from The College of New Rochelle in New Rochelle, NY, a private Catholic college founded by Ursuline nuns in 1904. She joined The College of New Rochelle in 2010 as Vice President for Student Services. Starting in 2014, she served as The College of New Rochelle's Senior Vice President for Strategic Initiatives. Earlier, Dr. Geary was Dean of Students at Manhattan College in Riverdale, NY. Over a 14-year span, she provided oversight to Student Life, Performing Arts, Residence Life, International Student Advisement, Counseling and Health Services. She was also a faculty member for more than a decade in the School of Education, teaching students in the master's degree program in counseling. Prior to that, she was in private practice as a clinical psychologist and served on staff at the Department of Veterans Affairs hospital in Montrose, NY. Dr. Geary is the first laywoman to lead St. Scholastica, and the first female president since Sister Joan Braun served as interim president from 1974 to 1975. Dr. Geary and her husband, Michael, have three adult daughters: Brianna, Cailean and Mariah.